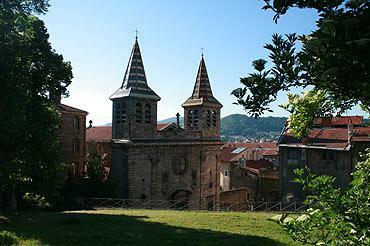 Le-Puy-en-Velay, in the heart of the Massif central, is a historical town in an impressive setting surrounded by high hills and the famous conical volcano forms of the region. 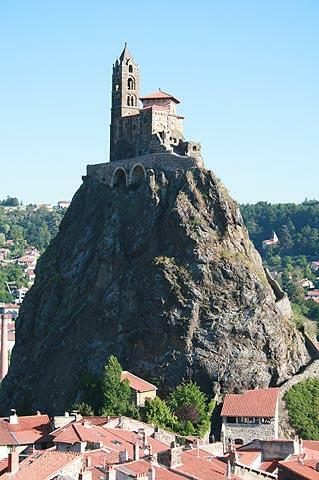 This isolated position does make Le Puy a bit difficult to reach, but it is a journey worth the trouble: destpite its position the town is a major attraction and receives more than 700,000 visitors each year. Le Puy is most famous for being the starting point of one of the main pilgrimage paths in France that lead to Santiago de Compostella, and the religious monuments that are a result of this important historical role. 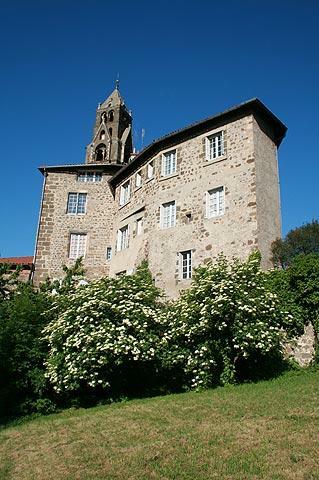 The most important historical monuments to visit in Le-Puy-en-Velay are below. France This Way comment: note that the three religious sites each have an admission charge so if you are visiting all of them buy a combined entry ticket at your first port of call to save significantly on the total cost of entry. 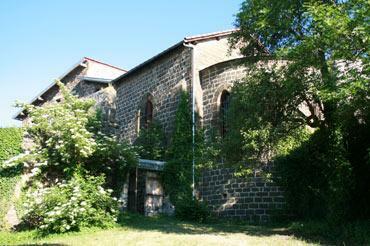 A remarkable site perched high on a rocky pinnacle, the chapel was built in the 10th century. Hike up the numerous steps to the Church of Saint-Michel, and be glad that you are not carrying the material for its construction with you. Its construction was a remarkable feat by the Bishop of Le-Put to celebrate his return from his pilgrimage. 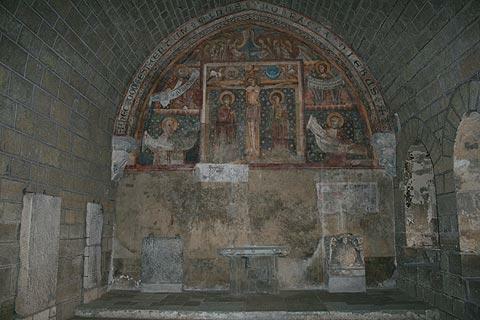 The chapel also contains a treasury and some impressive frescoes. The cathedral is the starting point for the long pilgrimage path (1600 km), and each morning there is a blessing for those about to set off on the journey. 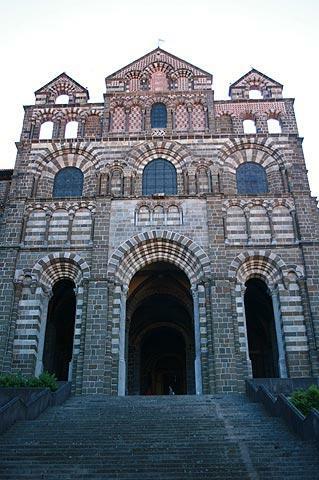 The cathedral facade is typical of those in the Auvergne, romanesque in style and with three rows of arches: the cathedral appears substantial, in part because it stands at the top of a long and broad flight of stairs. The cathedral cloister is very attractive, with an unusually decorative design in white, red and black mosaic around the arches, also in the roman style. In a room off the cloisters there is a large fresco, and upstairs there is a small 'treasury' room containing historical artefacts of interest. Head to the cabinet at the far end for my personal favourites: an 18th century black virgin with a scary looking character peering from her dress and a very early painted statue called the 'petite pieta' (mother and child) - very small and simple and very beautiful. 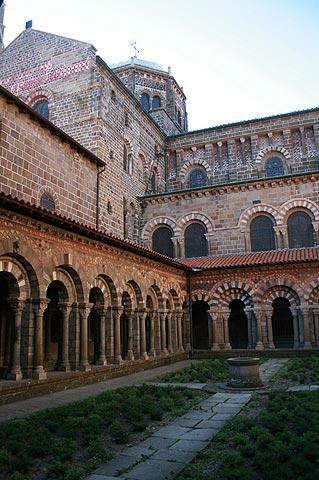 The cathedral and cloister is a listed National Monument in France. The Corneille Rock bearing the statue of Mary and the baby Jesus is visible from many parts of Le Puy-en-Velay: this pink statue was erected in 1860. Interestingly it was made using the metal obtained from hundreds of cannons that had been seized during the Crimean war and were given to the town by Napoleon III. The path up the rock to the statue is a peaceful stroll, leading to fine views across the town and surrounding region. 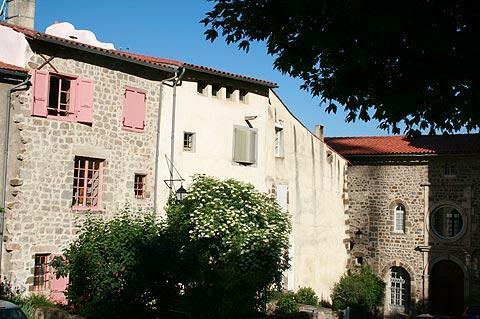 There is a large square to the south of the town (towards the Henry Vinay Garden) called Place de Breuil where markets are held and you can find the Le Puy-en-Velay tourist office - pick up the useful map of the town here before setting off exploring. 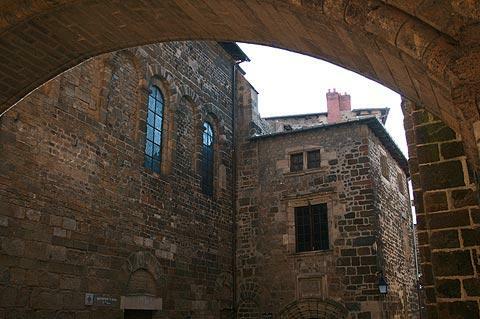 The historical town centre in Le Puy-en-Velay around the cathedral and called the Haute Ville is very attractive, with narrow streets to follow and a very impressive number of interesting buildings to discover around each corner. You will spend a lot of time just wandering and absorbing the atmosphere. In the lower part of the old town the number of shops and boutiques starts to increase - note there are many lace shops because lace was historically a big industry in the town. 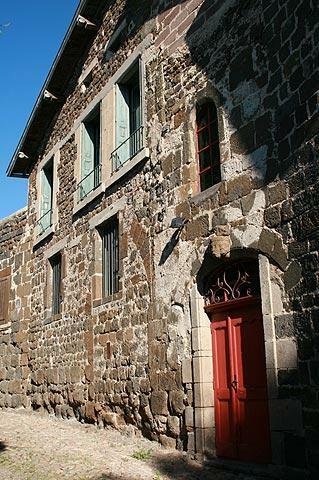 There is a substantial museum dedicated to lace in the region at the 'Atelier Conservatoire National de la dentelle de Puy en Velay'. Overall, Le Puy is an attractive, not overly-commercialised, town and well worth the effort to get there, as much for its setting and general ambience as its individual sights of interest. The cathedral in Le Puy en Velay is listed as a UNESCO World Heritage Site and the town is listed as a 'Ville d'Art et d'Histoire. This museum, established in the second half of the 19th century, is located in the pleasant Henry Vinay Park in the southern end of the town and features a very wide range of items from fossils to fine arts. 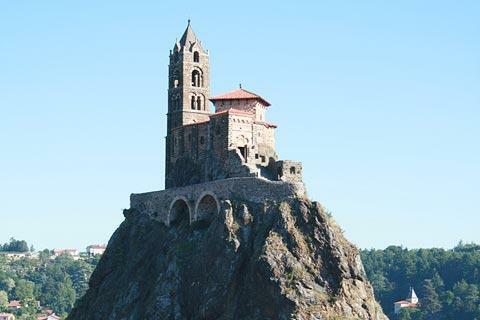 One place very close to the town that is worth seeing is Polignac, where a fortress has been built on a great rock that provides an extraordinary natural defence: Polignac is situated just north of Le Puy-en-Velay. We also suggest you visit the Cascade de la Beaume, a very picturesque waterfall near Solignac, a little way to the south of Le Puy-en-Velay and reached via a 20 minute walk through a tranquil wooded valley that starts near Agizoux. 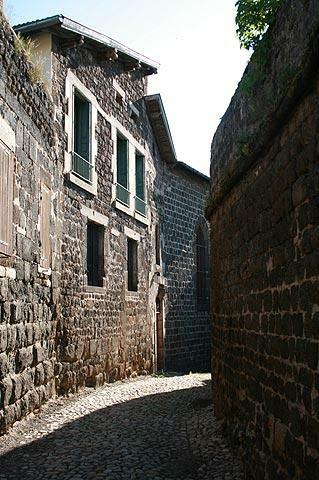 The town is also an excellent base for exploring the scenery of the Allier gorges. You can find more local travel ideas in the Haute-Loire guide and the Auvergne guide.